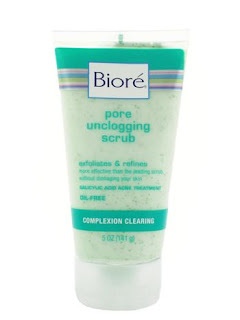 I've been using this Biore Pore Scrub ($7-8) for about 2 years now. It's very minty and refreshing when you rub it on and I mainly use it in the shower. The colour of the scrub is so delicious and it's full of little micro-scrubbing beads that I use my palm to rub into my face for exfoliation. My skin comes out feeling very smooth but the main con is that it's very drying so you'll have to use lotion afterwards. It does make a dramatic difference - when I don't use it for just a day or switch to some other cleanser, I immediately start to get a few red pimples. Deep cleaning for the win! A 5 oz bottle lasts me well over a year, so it's worth the price in the long run. I just wish it was somehow more moisturizing (add a bit of Extra Virgin Olive Oil, anyone?) but other than that it does its job.